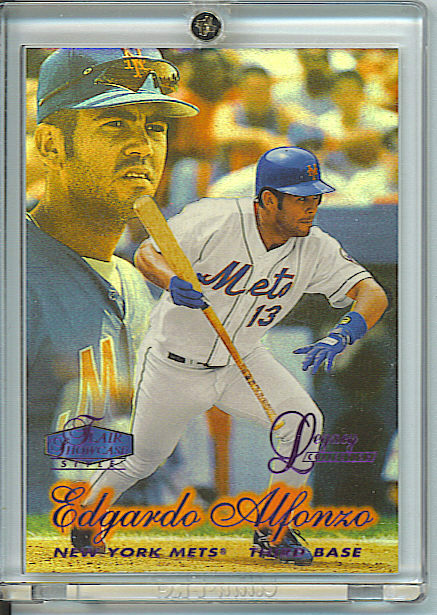 Base cards: The base set is comprised of 300 cards with the last 50 being shortprinted prospect cards, which fall in every 6 packs on average. From the short set, I received 170 cards with 29 duplicates and 3 triplicates. 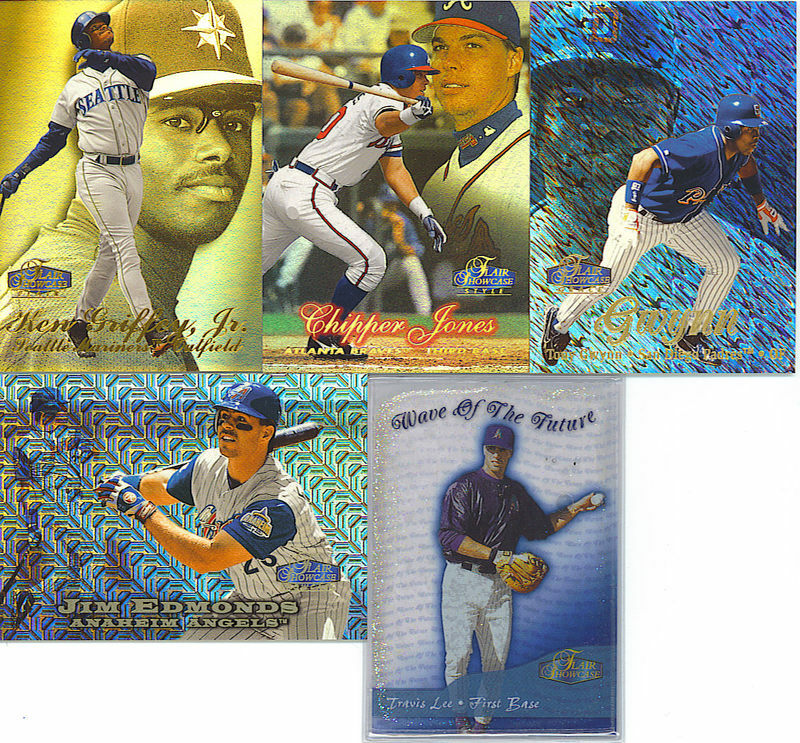 My prospect cards were of Chris Woodward, Buddy Carlyle, Jacque Jones, Eric Munson, Erubiel Durazo, and Tony Armas, Jr.
Gold Medallion Parallel (1 per pack): One can expect to find a Medallion parallel in each pack, each of which has been die cut to round off the top of the card. The Gold Medallions are the most common and were the only kind I pulled from this box. All in all, there were 24 Golds, 1 for every pack in the box. I pulled my share of stars including Roger Clemens, Mark McGwire, Frank Thomas, Mariano Rivera, Larry Walker, Mike Mussina, and others. 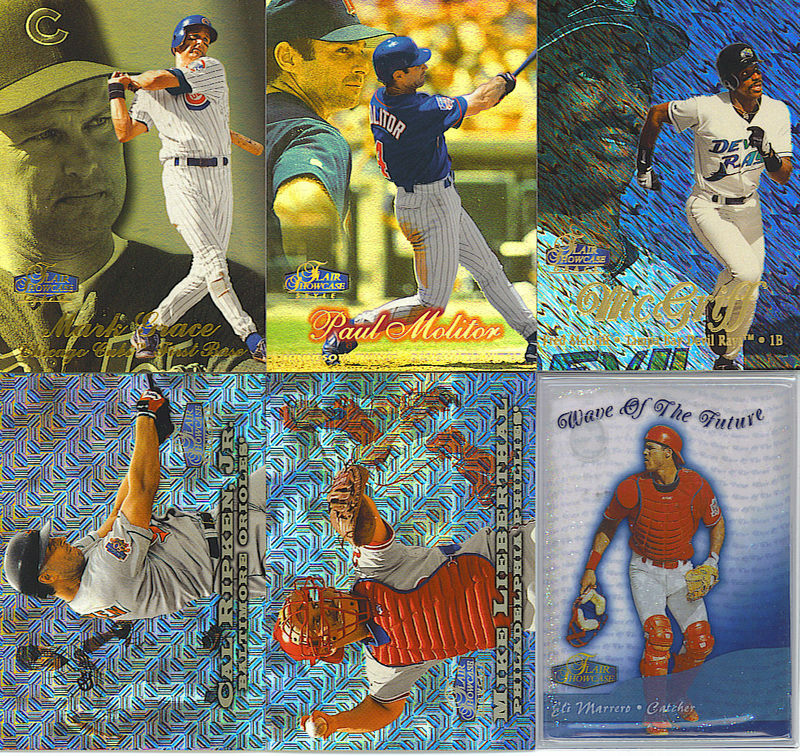 Naturally, I chose to scan the crappiest one of them all, Rey Ordonez. Gold Medallion prospect cards are seeded 1 in every 24 packs, but I did not pull one. If you’re lucky, there are 2 other parallels can you find in place of these Gold Medallions. The first are the Platinum Medallions. Instead of gold, these cards have a platinum finish to them and are numbered to just 50 (the prospects are numbered to 25). The second are the Masterpiece parallels. These cards look similar to the Platinum Medallions, but have purple foil over the front text and are limited to just 1 copy each. Here’s an example of a Platinum Medallion card from my personal collection. Diamond Mine (1:6 packs): The most common insert in this product is called Diamond Mine. This silver-foiled insert set is comprised of 15 cards and features the game’s best. I pulled 3 in this box: Tony Gwynn, Juan Gonzalez, and Vladimir Guerrero. These cards don’t look nearly as cool as they do in the scan above. Alright, so that wasn’t as great as the “gangster backs” of the Skybox cards, but still………HA!!! 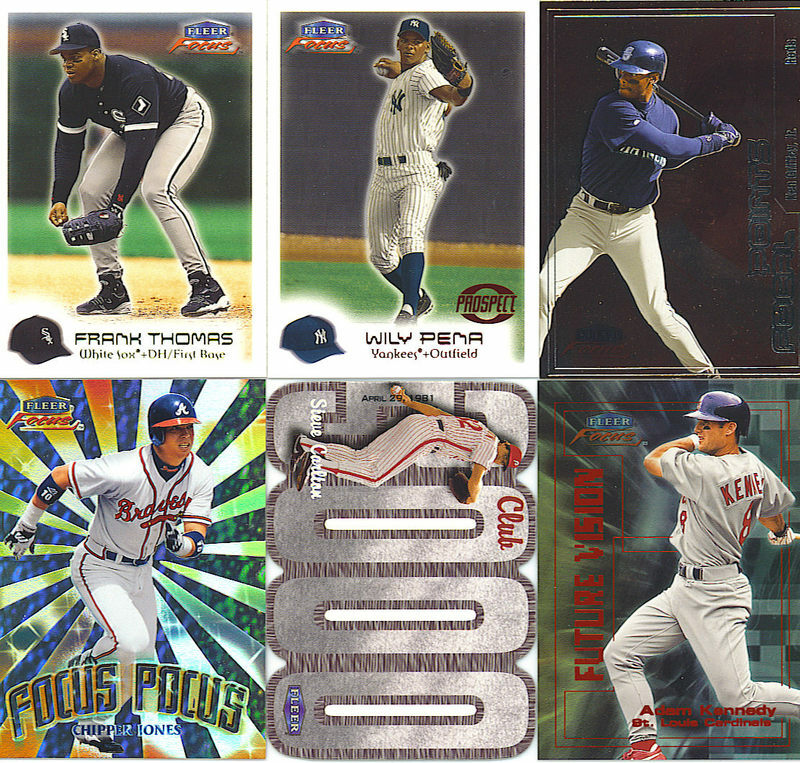 Swing Kings (1:24 packs): These are acetate cards, but are still relatively simple. 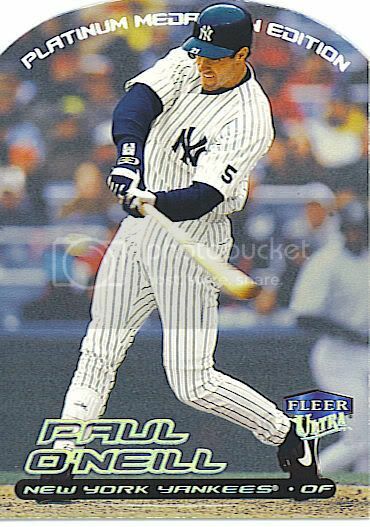 Out of the 10 cards in this set, I pulled a Derek Jeter and a Mark McGwire. Let’s see if there are any asinine comments on the backs of these. What WASN’T Pulled: Oh boy, this is going to be long. First, there’s an insert called Crunch Time. These cards are seeded 1 in every 3 boxes and are reminiscent of the Leather and Lumber inserts from 1997 Donruss Elite. There’s a rare insert called Ultra Talented, which are numbered to just 100. At this time, I’m unable to find a picture of those (haven’t seen one in years). Feel the Game made its Ultra debut in this product. 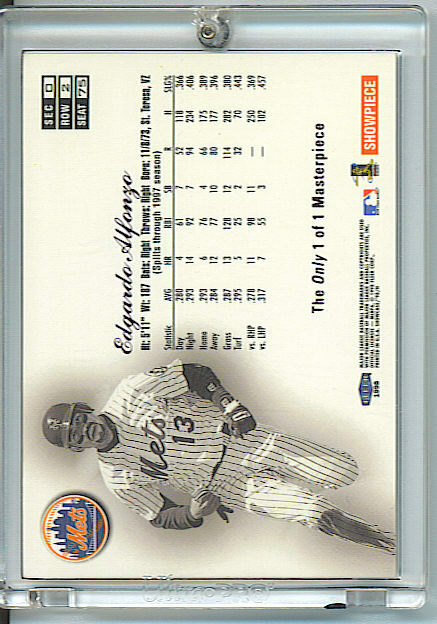 In every 7 boxes on average, one could pull a game-used jersey or batting glove swatch from 1 of 15 different players. Lastly, there was the Fresh Ink autograph set. This set had over 60 subjects in it and print runs ranged anywhere between 1000 (lower-end guys like Matt Lawton and Jeremy Giambi) and 95 (Jeter). A quick rundown of some of the names in this set: Barry Bonds, Frank Thomas, Derek Jeter, Alex Rodriguez, Cal Ripken Jr., Tony Gwynn, Curt Schilling, Wade Boggs, Greg Maddux, Alfonso Soriano, Randy Johnson, and much more. 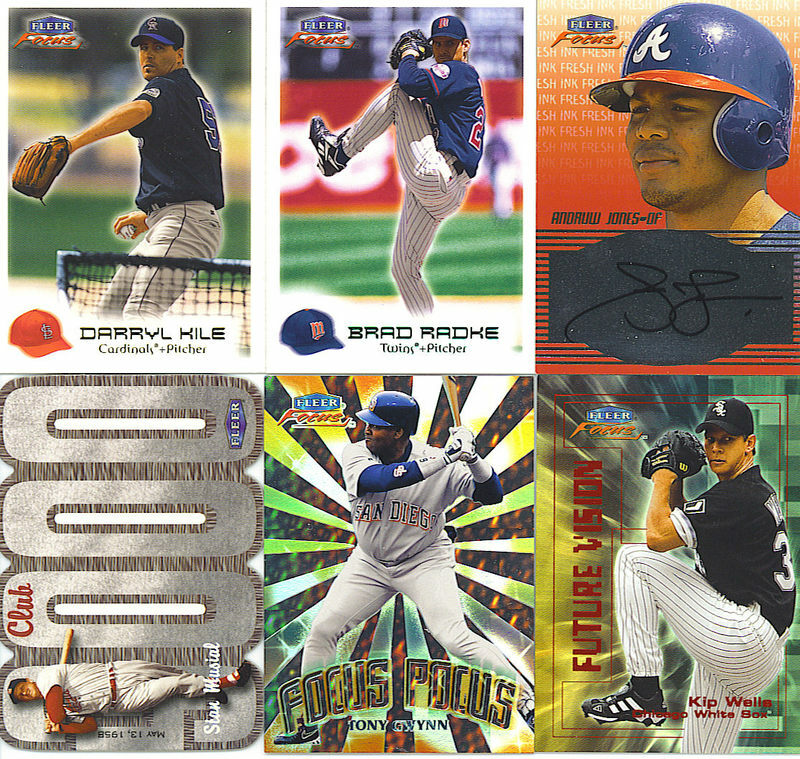 One such card is a triple autograph featuring Wade Boggs, Tony Gwynn, and Nolan Ryan. It is limited to 100. I also did not receive any Club 3000 cards. Final Thoughts: This box certainly turned out to be a dud, but it in no way affects my opinion of the product. A box contains 24 packs of 10 cards of each and should run in the $30-35 range. There are plenty of nice hits to chase after for a fair price. My bud Andrew, aka “slugger82685” on Youtube broke a box of this very product a couple months ago and did very well for himself (TWO autographs AND a Platinum Medallion!). Check out the video here. As always, thanks for the read and good luck on your breaks!